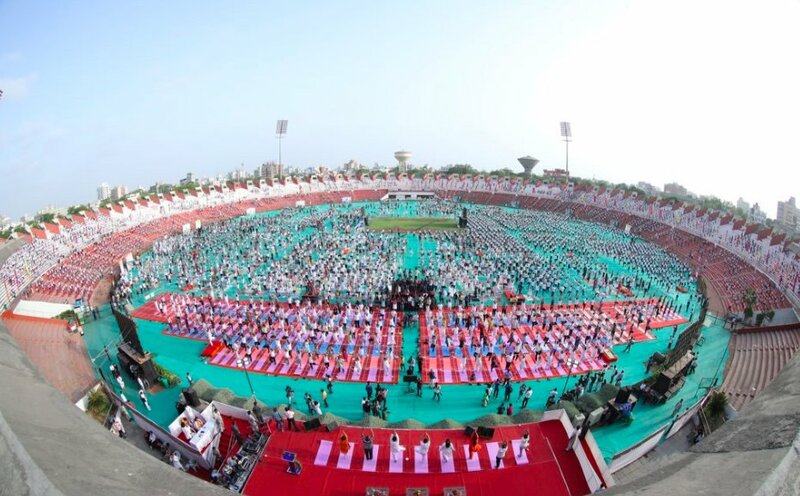 Ahmedabad: The State-level International Yoga Day, being celebrated in the world due to efforts of Prime Minister Narendra Modi, was held at the Sardar Patel Stadium here today, with Governor O.P. Kohli, Chief Minister Vijay Rupani, Union Minister of State for Law and Justice P.P. Choudhary, Ahmedabad Mayor Bijalben Patel and a large number of people joining yoga asana. The Governor and the Chief Minister felicitated the winners of the state and district level yoga competitions at the Khel Mahakumbh and presented them with citations..
Others present during the event included Youth Services and Cultural Affairs Secretary V.P. Patel, Commissioner Satish Patel, Municipal Commissioner Mukesh Kumar, Ahmedabad District Collector Vikrant Pandey and senior officers.